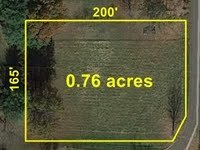 Nice, flat 1.2 acre lot next to a small stream in Schuyler County, IL. The property is in a very quiet, secluded area that is heavily wooded and has frontage on a gravel country road. It would make a fantastic camping site. We would allow hunting and target shooting on the property, but are leasing it it as a camping lot as it is really too small to provide adequate size for hunting. It would be a great place to park an RV! Click here for more about this property! Great clean large lot in town. Great Cabin or Camp Site. Very nice 0.6 acre wooded lot. Recently surveyed with boundary markers in place. Location: Country Lot near Olney, IL. 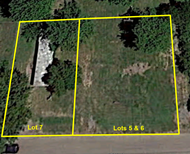 Great building lot for St. Louis Commuters!!! This is an really nice, large 0.76 acre flat lot in an intimate, lake subdivision. Live the country lifestyle in a beautiful setting less than an hours drive away from downtown St. Louis! Location: Country Lot near Grafton, IL! Looking for a different type of property? Fill out this brief survey (takes no more than 30 seconds).